Bed Shown Includes Headboard Only. Rails and Footboard Sold Separately. 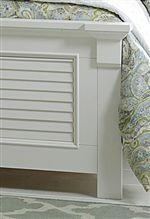 Louvered accent panels are framed by arched crown moulding to give this headboard a cottage style feel. Crafted from solid poplar and pine this panel bed is perfect for your master or guest bedroom. 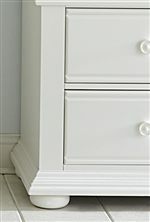 The oyster white finish will brighten the room for a cozy, warm environment. Bead mouldings frame the panels to complete the cottage style of this beautiful piece. 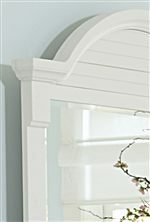 The Summer House Arched Twin Panel Headboard (Only) by Liberty Furniture at Furniture Fair - North Carolina in the Jacksonville, Greenville, Goldsboro, New Bern, Rocky Mount, Wilmington NC area. Product availability may vary. Contact us for the most current availability on this product. 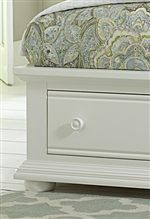 The Summer House collection is a great option if you are looking for Transitional Cottage furniture in the Jacksonville, Greenville, Goldsboro, New Bern, Rocky Mount, Wilmington NC area. Browse other items in the Summer House collection from Furniture Fair - North Carolina in the Jacksonville, Greenville, Goldsboro, New Bern, Rocky Mount, Wilmington NC area.